The day today has gone by without realizing it. So many things to do.. Well, no moaning, it's better to be occupied with many small things that you like than sit around and wait for something exciting to happen, right? 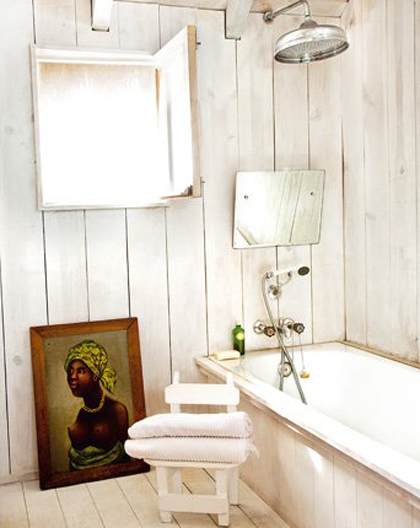 I'm sharing with you some shoots of really inspiring rustic bathrooms, bright and natural, more of an ethnic style (isn't that afro woman and the tiny white chair in the first image brilliant?) or with a more country touch (I love that pebble floor of the second image- thanks Si for the inspiration!) and a wonderful stone wall as a background to the white, stone carved sink in the last photo. 4 comments on "Rustic essence"
I love the pebble floor also. Very nice photos. I love all 3 of these beautiful rustic shots. Love the pebble floor but also the gigantic shower head in the first!! 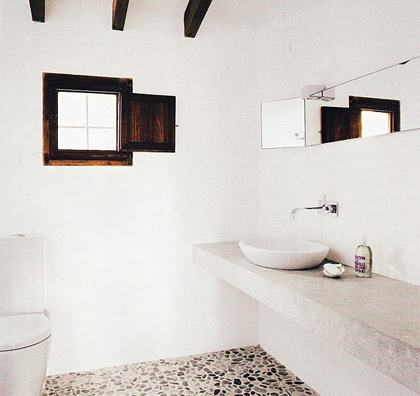 I've always wanted a bathroom with stone accents and walls. It's like living outdoors!